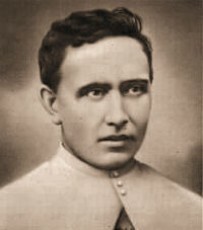 St. Damien De Veuster is also known as St. Damien of Molokai. He was born January 3, 1840, as Jozef De Veuster, and was a Roman Catholic Priest from Belgium. He was a member of the Congregation of the Sacred Hearts of Jesus and Mary, a Religious Institute. He gained recognition for his ministry in the Kingdom of Hawaii, with the people of Leprosy – also known as Hansen’s disease, who had been placed under a government sanctioned medical quarantine on the Island of Molokai. After sixteen years of caring for the physical, spiritual and emotional needs of those in the leper colony, he eventually contracted and died of the disease, and is called by the Church, a “Martyr of Charity”. He was the tenth person recognized as a saint by the Catholic Church to have lived, worked, and/or died in what is now called the United States. In the Catholic Church, St. Damien is venerated as a Saint, one who is holy and worthy of public veneration and invocation. He is the Patron Saint of the Diocese of Honolulu. He was the seventh child and fourth son of a corn merchant. He attended college at Braine-le-Comte, and then entered the Novitiate of the Congregation of the Sacred Hearts of Jesus and Mary in Leuven. He followed in the footsteps of his sisters Eugenie and Pauline, who became Nuns, and a brother that became a Priest. He nearly didn’t get accepted, because of his lack of education, but held the ability to learn. He prayed daily before a picture of St. Francis Xavier, patron saint of missionaries, something he desired for himself. St. Damien landed at Honolulu Harbor on Oahu as a Missionary, on March 19, 1864. Two months later he was ordained a Priest on may 21, 1864, at the Cathedral of Our Lady of Peace, a Church that was founded by his religious Institute. It was here that he was assigned to the Catholic Mission in North Kohala. It was also at this time that Hawaii was facing a public health crisis. Several diseases, brought to the Hawaiian Islands by foreign traders and sailors, infected some Native Hawaiians. Thousands upon thousands, of Hawaiians died of influenza, syphilis, and other ailments that had never before been seen there. Leprosy was one of these diseases. At that time, it was believed that leprosy was highly contagious, but it is now known that nearly 95% of human beings are immune to it. Knowing that the Lepers needed a Catholic Priest to assist them, the Bishop realized that this assignment could become a death sentence. He did not want to send any one person “in the name of obedience”. The Bishop prayed about it, and in the meantime, Fr. Damien volunteered to go.